What are Fennel seeds (Saunf) ? Fennel seeds are seeds of the fennel plant belonging to the parsley family. These seeds are widely used as a spice and have a sweet taste that is similar to the spice anise. This spice is an essential ingredient in the Mediterranean cuisine and is native to the South European region. Fennel seeds (sauf) are the most sought after aromatic spice having a number of culinary and medical uses. Most of the Indian households consume a small quantity of these seeds at the end of every meal. The benefit of this age-old Indian practice isn’t limited to beating bad breath. Being a concentrated source of copper, calcium, iron, manganese, potassium, magnesium, zinc, and selenium fennel, fennel seeds offer countless benefits to the body. The popular ones are listed here. What are Fennel seeds called in Different Indian Languages? Fennel seeds are commonly known as saunf in hindi, In Gujrati they call it Variyali, It's called Badishep in Marathi, Sombu in Tamil, Sopuginja in Telugu and Perumjeerakam in Malayalam. The medicinal values of fennel has made it a symbol of longevity and courage. It has health benefiting dietary fibre, nutrients, anti-oxidants, essential compounds, vitamins, and minerals that add to the health of an individual. Fennel contains antioxidants like quercetin and kaempferol. These powerful compounds clear harmful free radicals from our body, while offering protection from infection and cancers. These Antioxidants also prevents many diseases that can get serious at a later stage. 100 g of fennel seeds offer the benefit of 39.8 g of insoluble fibre. This roughage is highly beneficial for the metabolism as it eases constipation problems and maintains the health of digestive system. The dietary fibres present in fennel seeds bile the salts that are produced from cholesterol. The fibres also prevent the salt from re-absorbing in colon. This further reduces LDL cholesterol levels. The composition of the dietary fibres and flavonoid anti-oxidants offers protection to the colon mucusa. Fennel seeds have anti-flatulent properties and volatile essential oil compounds like limonene, anethole, pinene, anisic aldehyde, fenchone, myrcene, cineole and chavicol. These compounds are carminative and great antioxidants. Fennel seeds are rich in minerals like iron, copper, potassium, calcium, selenium, manganese, magnesium and zinc. Copper and iron are important for red blood cells production. Zinc regulates nucleic acid synthesis, development, and growth of an individual. It is also crucial for sperm generation. Potassium helps controlling blood pressure and heart rate. Fennel seeds are a rich source of many vital vitamins such as Vitamin A, Vitamin C and Vitamin E. These seeds also have many B-complex vitamins namely pyridoxine, thiamin, niacin and riboflavin. You can get rid of various digestive problems including indigestion, flatulence, bloating, colic, constipation, irritable bowel, and even heartburn with the use of fennel seeds. Fennel juice is a common home remedy used to treat acidity. It is known to have a calming effect on the intestine. It’s anti-spasmodic properties of work to reduce intestinal cramps, bloating, and flatulence. Fennel seeds contain contain certain essential oil compounds which stimulate the secretion of digestive juice, reducing stomach inflammation. Having this juice improves the absorption of nutrients from the foods we eat. Fennel tea works as a diuretic. Its regular intake will flush out excess fluids from your body. You can get rid of symptoms of fluid retention like puffy eyes on using strong fennel tea. Furthermore, the risk of urinary tract issues is reduced with its use. Fennel combats obesity by creating a feeling of fullness and suppressing the appetite. This herb tops the list of excellent natural fat busters as it breaks down fats and boosts metabolism. Fennel seeds also reduce temporary weight gain caused due to water retention. This herb not only stimulates digestion but also soothes the digestive tract. It aids in rebuilding of the digestive system after chemotherapy or any other radiation treatments. Factors like poor diet and stress can adversely affect the menstrual cycle of a woman. The emmenagogue properties of fennel promote proper menstrual flow. In addition, these seeds have phytoestrogens that treats menopausal disorders, breast enlargement, and premenstrual syndrome. Studies show that Fennel bulbs can regulate hormonal changes in the human body. Its mild analgesic properties helps to control and cure menstrual cramps in women. Fennel seeds have high amounts of folic acid, potassium, iron and Vitamin C. All of these compounds work wonders in treating anaemia and various immunity issues. 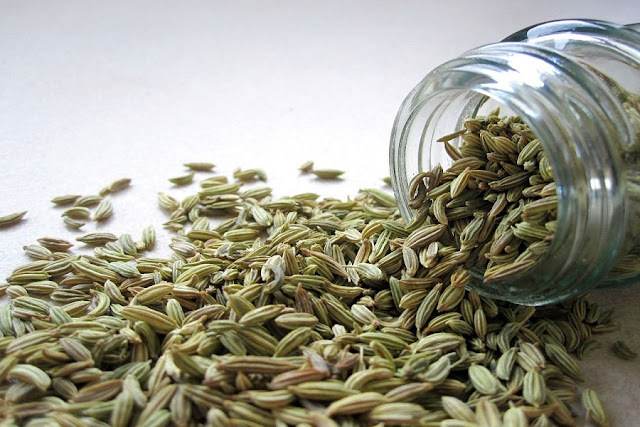 Regular consumption of fennel tea twice daily effectively promotes breast milk production. Intake of fennel seeds in powdered form stimulates gastric juices, which encourage proper bowel movement. It works as a laxative. The roughage helps clear the bowels and helps the intestines to maintain proper peristaltic motion thereby promoting proper excretion. Fennel seeds being loaded with antioxidants have proved to be very effective in stopping the growth of carcinogenic diseases at the right time. These seeds contains some very vital oil compounds like myrcene, fenchone, chavicol, cineole which help in proper digestion and antioxidant reactions in the body. Fennel seeds are a good source of Copper and iron, which are important for red blood cells production in the body. The Zinc compounds present in Fennel seeds regulates nucleic acid synthesis, development, and growth of an individual. This spice being a good source of Potassium that helps controlling blood pressure and heart rate. Fennel seeds help in improving eyesight as it contains several essential nutrients needed to maintain eye health. Drinking fennel juice rejuvenates the eyes and prevents macular degeneration as it is rich in antioxidants and amino acids. You can also apply Fennel juice topically on your eyes to reduce eye irritations and fatigue. Fennel Juice has amazing diuretic properties. Having fennel juice regularly will help to flush out excess fluids from your body. It will also get rid of symptoms fluid retention like rheumatism and swelling. Having this juice also helps in preventing the formation of kidney stones. The phyto-estrogen present in fennel seeds is a chemical that is similar to the hormone estrogen in structure. Thus, having fennel juice regularly helps women suffering from menopause and pre-menstrual problems. This juice is also a good source of folate, which works to prevent birth defects in unborn babies. Drinking this juice is known to ease menstruation problems by managing hormonal actions in the body. Increase in milk production is another benefit of fennel juice for Lactating mothers. As per research Fennel juice is said to release endorphins into the bloodstreams, which help with lowering depression. Fennel juice also contains Potassium which increases brain function and the cognitive abilities of the brain. This juice also increases the oxygen supply to the brain and prevents dementia. The essential oil obtained from this seed is known to be a natural aperitif and helps in boosting your appetite. The violent and involuntary contractions of the organs, respiratory tract, intestines, muscles, and nerves is known as spasms. Spasms can lead to chronic cough and acute pain and inflammation. Spasms can also lead to fainting and even death if it is severe. The essential oil of this seed is an active antispasmodic agent, which works to relax the intestines, muscles and nerves and provides instant relief from spasms. The essential oil derived from fennel seeds contains many chemicals, which have antiseptic and bactericidal characteristics. The antiseptic property of this oil helps prevent wounds from turning septic. This oil prevents the offset of tetanus and other post-surgical infections as well. This essential oil works as an active carminative agent which helps release gas from intestines and provides instant relief from digestive problems like stomach pain, restlessness, heartburn and indigestion. It also helps in stopping the formation of gas and helps treat excessive flatulence. Fennel bulbs are known to have strong anti-inflammatory properties. They work excellently to reduce inflammation that is internal as well as external. They contain anethole which is known to be a very strong anti-inflammatory flavonoid. This flavonoid easily cures inflammation caused in humans without the risk of any side-effects. The natural cooling and neutralizing benefits of fennel bulbs help in treating the problem of acidity. Consuming fennel bulbs makes the intestines active and eases the process of absorption of food. These bulbs also help in separating the the toxins from useful minerals. The separated toxins are easily flushed out of the body and a normal PH level is restored which gives relief from acidity. We all know that Vitamin C is a natural immunity boosting vitamin for us humans. Fennel bulbs are loaded in vitamin C. Hence; daily intake of these bulbs strengthens the immune system. It keeps the body safe from minor infections naturally. It also increases the body’s capacity to fight back major infections. A stronger immune system results in active WBCs which fight all the disease-causing bacteria and viruses and destroy them. Cineole found in fennel bulbs is an active agent that helps in clearing the nasal blockages. This is an amazing home remedy for people suffering from congestion, asthma, and bronchitis. Cineol effectively clears and controls the formation and accumulation of phlegm in the chest and nasal passage and helps to ease respiration. Fennel bulb contains Potassium which is an active component of cranial nerves. Potassium also helps in maintaining the electrolytic balance of the brain. Potassium is also a natural memory charger which ensures proper functioning of the human brain by regulating the levels of potassium. It also works to sharpen the memory and improves focus and concentration.